The Alien Zoo … And You! ‘The sign on the enclosure wall read: GREEPERS. But perhaps it would have been more accurate if it had said: HEAPS OF GREEPERS. And only two kids to save all its creatures from a terrible fate. 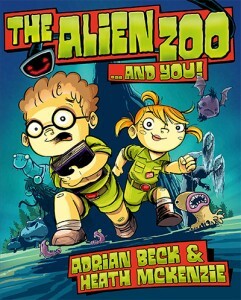 Funny, mysterious and a little bit rude; hold on to your hippos and look inside The Alien Zoo!